Fun cake to make, I must have stood at least half an hour in front of my two 7″ cake layers trying to figure out how I was going to turn them into a frog! I was clueless and for once, I didn’t find anything helpful on the net where I get most of my help. 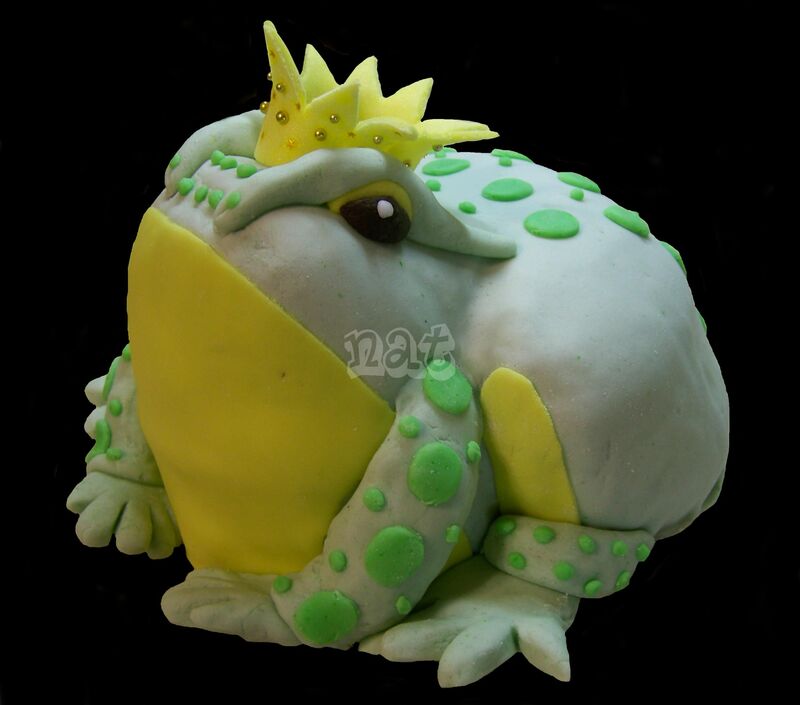 I’d find lots of frog cake pictures but nothing explaining how to carve out the shape. Slowly but surely I was finally confident to make my first cut and once I did it was more obvious to me. I started by cutting out two small triangles at the legs on each side to round the head area. Once I had my two long triangles aside, I put them together into a half moon and placed them on the top, in front for the head. I filled in all the gaps with chocolate ganache and my frog appeared! I love it when things go smoothly that way, I was scared it wasn’t going to be so at first. The filling is a black magic chocolate cake with layers of vanilla and orange cookie cream and I used a whipped dark chocolate ganache under the fondant. Sweet frog prince!